Summary. The pictogram informs about the necessity of dematerialization from the level of global cataclysms as a result of Earth magnetic field decreasing. Otherwise the civilization of Earth will be destroyed. For the first time in 2010 is presented the pictogram with the instruction for dematerialization of all civilization from the level of global cataclysms together with symbols of magnetic field. The mankind has to make the Transition to the Highest level of the material world where the next cycle of a life – the Correction cycle will begin. To make this Transition it is necessary to transform a body. It can be made only by the united consciousness action which will be caused by all civilization. To understand what Transition it is necessary to make civilization and how our body will be transformed we will consider the following information: the system of the Universe; humanity’ cycles of life and the Law of the united consciousness action. Transitions on parallel levels of the material world ETC make constantly at intergalactic flights in the universe by teleportation. ETC help all young civilizations to make their first Transition from one cycle of life to another. Today such Transition have to make we, the young civilizations of Earth. All ETC pictograms reveal our life from consciousness point of view. So, they use the language of other level of the Universe – not the material world, but the Information world where our consciousness works. In the history of science are known cases when the same idea simultaneously comes to scientists, living in different parts of the world and knowing nothing about each other. World famous Academician Vernadsky believed that around Earth there is information field. All people are attached to information field and scoop information from it. It turned out that this is not a field, but a completely different level of the Universe – the Information level. So, what is the Universe? The Universe – is unimaginably huge system of visible and invisible for us worlds, absolutely different by their nature. All worlds are interconnected and make mutual influence on each other. The purpose of the Universe is formation and improvement of consciousness. The Universe has three basic levels: the Absolute, the Information world and the material world. The system of the Universe was created and is managed by the Creator from outside of the Universe. Our universe together with us is located on the lowest level of the material world – on the level of Crystal structures. At the level of Crystal structures our body is solid. At the Intermediate level, the body is presented by hologram with weight. At the Highest level of the material world the body is presented by weightless hologram. In the material world there is a space and time. In the Information world, there is no space or time, but only information. The information world is an information storehouse, the library of the material world. It contains the complete information about each material object of the universe: stars, galaxies, planets etc. and about us also. In the Information world a human being is represented by information cell (fig. 2). The interconnection between the material world and the Information world ETC showed in moai of Easter Island (fig. 3, fig. 4, fig. 5). Moai represent human being on two levels of the Universe. A grey body of moai shows a human being at the level of the material world (fig. 3). A red hat represents information cell of human being in the Information world (fig. 4). By red color are made also pupils of the idol (fig. 5). The unique sitting idol named Tukuturi is also made of a red tuff. This red moai represents the Information world. Thus, ETC introduced a special color separation between objects of the material world and its representations in Information world. ETC in their messages inform that the mankind’ life in solar system goes by cycles. Thus transition from a planet on a planet occurs through the parallel worlds. Complete life cycle of humanity on Earth consists of two cycles – the cycle of Consciousness and the cycle of Correction. Each cycle of life takes place on different of parallel levels of the material world. The cycle of Consciousness in which today we live and make decisions, passes at the lowest level of the material world - a level of the Crystal structures. Our next cycle of life – the cycle of Correction will take place at the Highest level. This cycle will also pass on Earth, i.e. in the same harmony. In the cycle of Consciousness occurs a consciousness self-improvement, we make decisions ourselves. In the cycle of Correction happen forced adjustment of consciousness in accordance with the Universe laws. The purpose of the cycle of Correction – the final correction, which is made by fire. It is a hell and paradise according to the Holy Scriptures. In the cycle of Correction on the Highest level our body will be holographic. With the end of the cycle of Correction the complete cycle of mankind’ life on Earth will be also finished. After this the Transition to the harmony of the next planet Venus will happen. Hence, at the end of the cycle of Consciousness in which we live today, mankind has to make the Transition in the next cycle – Correction. It will happen at the moment of formation of civilization’ united consciousness. It means the transition of consciousness from the fourth level to the fifth. About this Transition of humanity inform all objects of ETC System of Information Transmission including the Nazka Lines, crop circles and etc. All ETC pictograms include two principles of coding: analogue and digital. A key for analogue principle of coding of ETC messages is the information cell of human being. This is a representation of human being on the Information level of the Universe. The structure of object’ cell is defined by consciousness level. The information cell of the individual is represented by a ring with a small dark circle in the centre. The circle in the centre is a brain area of cell; a ring represents a cell’ border; area between them – a body area of a cell (fig. 6). 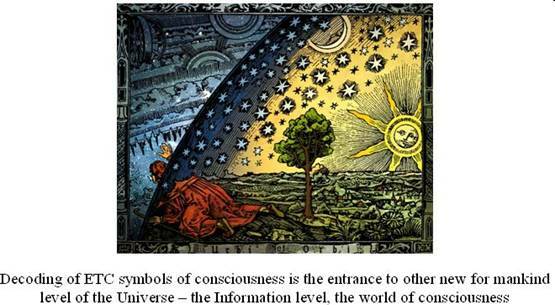 Cells of individual and united consciousness are a basis of all ETC pictograms. Two individual cells mean two individuals. If these people unite consciousness, a brain area shifts to cell’ border. As a result the united consciousness cell with the expanded area of a brain turns out. This is the Principle of the united consciousness formation. Extension of brain area of the united consciousness cell occurs by combining two small brain areas of individual cells. On the other hand, at shift of a brain area crescent is formed. If all of us together unite consciousness the brain area of united cells will expand, and we will make the Transition into the parallel worlds! Principle of the united consciousness: at association of two individual cells one cell of the united consciousness with expanded brain area is formed. FORMATION OF THE UNITED CONSCIOUSNESS CAUSES AN ACTION. THIS ACTION IS NOT SUBJECT TO LAWS OF THE MATERIAL WORLD, BECAUSE IT IS A RESULT OF THE REARRANGEMENTS OCCURRING IN THE INFORMATION CELL. THE TYPE OF REARRANGEMENTS IS DETERMINED BY THE chosen GOAL. The Principle and the Law reveal possibilities of consciousness and are fundamental. They lay in the basis of all consciousness phenomena. The action caused by united consciousness can hit, rise in the air and etc. Force of the united consciousness action we can even measure. The united consciousness action gives rise to different phenomena: levitation, telekinesis, dowsing, clairvoyance, etc. Among people who revealed possibilities of the united consciousness action are Nostradamus, Bolgarian predictor Vanga, American sleeping prophet Edgar Cayce and others. History has remained the information about the Scottish medium of XIX century Daniel Dunglas Home. He possessed unusual abilities for clairvoyance, levitation – flights at different altitudes and other manifestations of the united consciousness phenomenon. Among his close friends and acquaintances were European monarchs and members of their families, including, emperor Napoleon III, the Russian emperor Alexander II and others. On Home’ sessions were famous scientists. Among ordinary observers was well-known English writer Sir Arthur Conan Doyle, who made his brief biography. Miracles performed by the united consciousness action, cause contradictory emotions: fear and hatred, resentment and admiration. Action of the united consciousness does not leave anybody indifferent. No wonder the actions that cause unified consciousness, called phenomena. We consider them a manifestation of adventurism, charlatanism, tricks and machinations of witches - everything, but only not work consciousness. Therefore inquisition fires flared, persecutions on witches were arranged. Even today in the 21 century wise humanity has failed to understand the causes of these phenomena. That is why the Principle of the unified consciousness is widely represented in the crop circles and other objects of ETC System of Information Transmission. ETC showed this Principle by means of huge multiton slabs, softened stones and pulling of outgrowths. Burning out of drawings on a rocky surface of the Nazka plateau and bending of plants ears on cereal fields, the softening of stone and carved masonry for information transfer show possibilities of ETC united consciousness action. Action of the united consciousness possesses one more the most important secret. It allows ETC to fly from a galaxy to a galaxy, overcoming huge distances in millions light years. So, in the given pictogram ETC inform mankind about this unknown possibility of the united consciousness. The united consciousness action is a basis of teleportation for intergalactic flights of extraterrestrial civilizations. This action causes a body transformation. It is necessary for the transition to other higher subtotal level of the material world for teleportation. 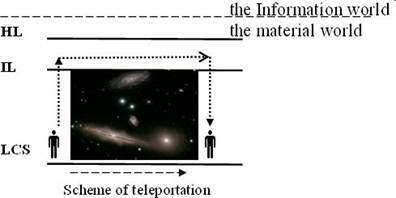 Teleportation process contains two stages: transition to some sublevel of the Intermediate level of the material world and returning again on the level of Crystal structures in the given place of the universe. Transition to other sublevel of the material world can be made only through body transformation. This process is accompanied by dematerialization from level of the Crystal structures. A body transformation can cause only an action of the united consciousness. For this purpose it is necessary to unite consciousness and to set a goal – transformation of a body for flight in given galaxy. As a result of information arrangements and compression of united cell in the material world will arise an action of the united consciousness. It will transform a body, and dematerialization occurs. Upon reaching a predetermined point in the universe ETC again materialize on the level of Crystal structures. So, there is how ETC teleportation works. ETC possessing the highest level of consciousness, can carry out teleportation, uniting even by two representatives. ETC assert that teleportation for us today, in the cycle of Consciousness of Earth is impossible, because mankind has very low level of consciousness. The strength of humanity’ united consciousness action is still very weak. We can cause an action, capable to transform our body, only by simultaneous uniting of consciousness of all civilization. In this case we will make the Transition not on the Intermediate level (IL), as at teleportation, but on the Highest level (HL) of the material world. There the next cycle of our life will begin. At the moment of the united consciousness of civilization’ formation with the set goal individual cells of all people of Earth will merge together into one. As a result the uniform cell of our civilization will be born. According to a goal internal redistributions will happen and the uniform information cell of mankind will be compressed. At the level of Crystal structures (LCS) an action of the united consciousness of mankind will arise a laser beam which will removes a body. 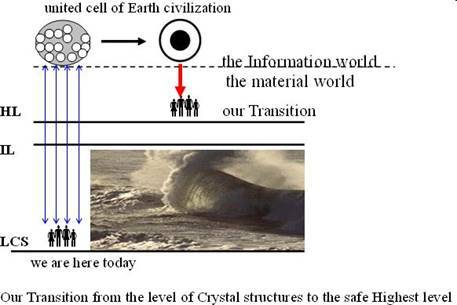 We will disappear from the level of Crystal structures where now we live and where soon will begin global cataclysms. Simultaneously we will arise again at other safe level – the Highest level of the material world where there is no cataclysm. At the Highest level of the material world will happen universal resurrection of mankind and begin a new cycle of our life. The process of resurrection is presented in the Holy Scriptures of many religions. 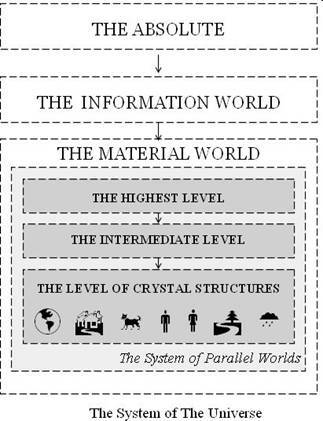 An information cell constantly has a projection in the material world in the form of material object with continuous interaction between them. It is necessary for consciousness perfection. When the communication between an information cell and human being is broken, he dies. As soon as our civilization will disappear from the level of Crystal structures, communication between humanity’s united cell and humanity will be broken. At the same time at the Highest level of the material world will be formed a new body projection not solid as today, but holographic. Thus, only the united consciousness will help us make dematerialization from level of global cataclysms and materialization on new, safe level of the material world. In consciousness symbolic process of dematerialization is designated by a special symbol – a pointed oval of dematerialization and Transition. ETC show that as a result of consciousness association and imposing of cells occurs dematerialization. In crop circles a process of dematerialization and Transition is represented by special symbols – pointed ovals. There are two types of an oval shape – wide and narrow. They characterize two phases of the Transition process. The wide oval – I phase of the Transition – is a result of our decision of consciousness association. The wide pointed oval arises as an overlapping zone at association of two information cells. This is the beginning of formation of civilization’ united cell. The narrow oval – II phase of the Transition. It means the formation of the uniform cell of Earth civilization. A narrow oval is a result of imposing of wide ovals of dematerialization at consciousness association. It characterizes deep information transformations in the uniform cell of Earth civilization. Today Earth civilization consists of 6.7 billion people. At synchronous association of civilization’ consciousness in the material world will arise improbable force of action as a laser beam which will remove a body from the level of Crystal Structures. At the same moment, a new hologram body will occur at the Highest level of the material world. This way the resurrection – the well-known from the Holy Scriptures event will happen. 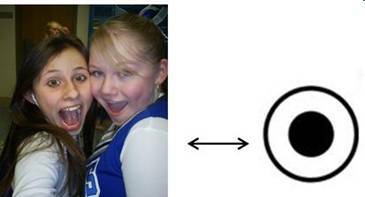 Now with knowledge of ABC extraterrestrial civilizations this pictogram is very easy to read. It transmits information about the necessity of dematerialization of Earth civilization connected with critical reduction of magnetic field and contains symbols: of magnetic field, dematerialization and humanity. This crop circle is created by a combination of elements of two previous pictograms. 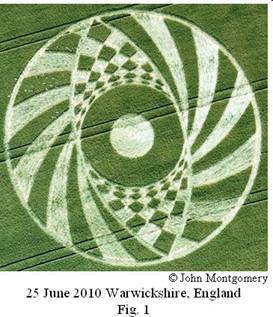 Both crop circles have been transferred in 2005 and presented on fields of England. One of them has appeared on 9 July 2005 in Silbury Hill and another on 21 August 2005 in Wiltshire. In the centre of all three pictograms the light circle is represented. It is a brain area of an individual cell (fig. 6, a red circle in the centre). The biggest light ring is an external border of this cell (fig. 6, red circles). The symbol of an individual cell is shown on fig. 7. The central light circle and a wide ring represent the symbol of the united consciousness cell (fig. 7). The symbol of the united cell is shown on fig. 9. Cell of the united consciousness (fig. 8) covers a pointed oval of dematerialization. This symbol is called «an eye of dematerialization». This combination of symbols indicates the necessity of our dematerialization through the united consciousness of humanity. As a result of a combination of this information, we get the following message. Mankind must immediately leave the level of global cataclysms and make the Transition to another level of the material world. Global cataclysms are a result of dramatic reducing of Earth magnetic field. The Transition can be made through our body transformation by an action of civilization’ united consciousness. Dark light strips (fig. 10) located as a fan represent crescent horns (fig. 11). The construction of this symbol is shown on the pictogram 9 July 2005 Silbury Hill. The symbol of the crescent is a result of brain area shift at consciousness association (fig. 12). Four small circles near the pictogram depict fourth level of human being consciousness. Thus, the pictogram once again urges mankind to make the Transition to other Highest level of the material world in order to avoid global cataclysms, which will begin on Earth in the nearest future.